Antique gold finished metal bead caps. Pre-packaged for fantastic value for money. 7mm wide. Approximately 85 caps per bag. 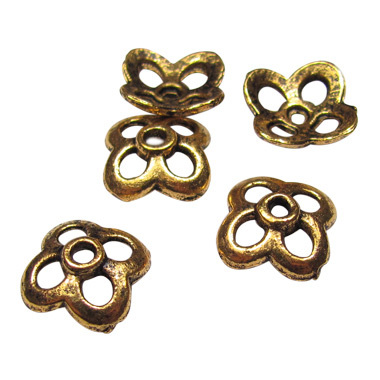 Antique gold finished metal bead caps. Pre-packaged for fantastic value for money. 12mm wide. Approximately 30 caps per bag. Bag of approximately 100 caps. Delicate bright silver toned metal bead caps, approx 5mm. These fit beads 6mm and larger. Bag of approximately 100 caps. Delicate bright gold toned metal bead caps, approx 7mm. These fit beads 8mm and larger. Bag of approximately 50 caps. Bright Gold Toned Wrap-around Bead Caps. Made from nickel free metal, with a bright gold finish. Handy petal bead caps, great for multi-strand designs or finishing off macramé. 7mm wide (to accommodate a 6.5mm strand).